The time had come for Bike in Tweed 2017. 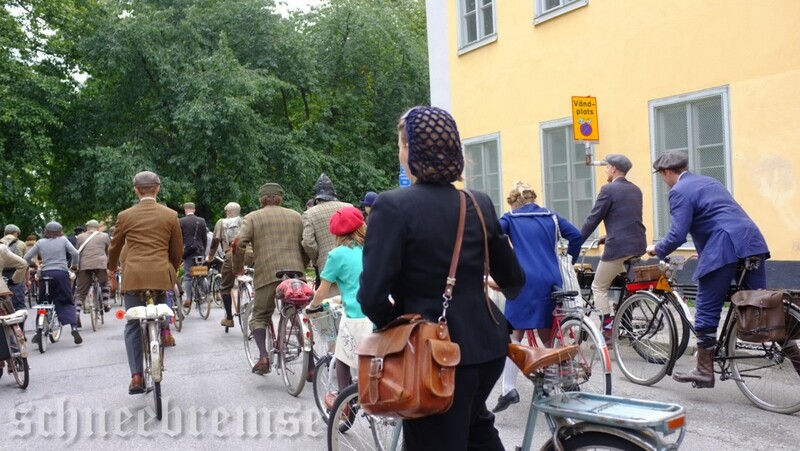 Stockholm’s version of London’s Tweed Run. I have always used vintage bicycles, I was more comfortable riding them than the modern mountain bikes and racers. In Denmark and Netherlands the upright riding position is more common than here in Sweden and that is how I like to ride a bicycle, upright. So I got to use the old bicycles, my fathers and grandfathers old Swedish made iron horses. I got to like them, they were easy to maintain and repair. 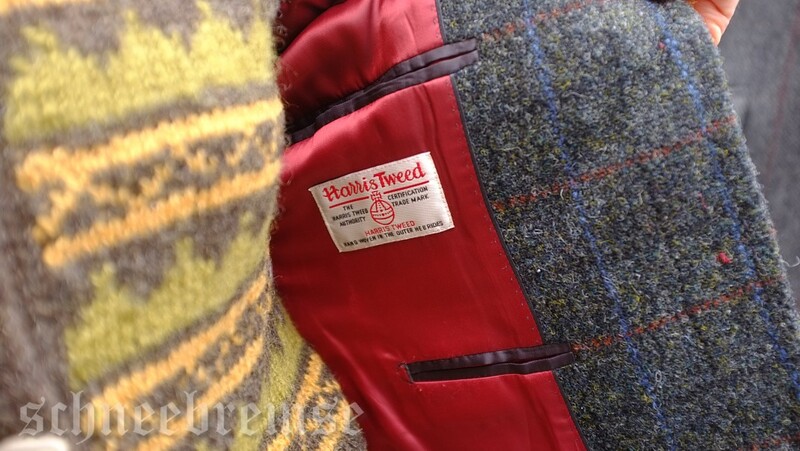 Because I had been using tweed my whole life it was a natural step to combine the two. That is why it feels great to join tweed events like this. The best of two things. We took a small break on our way in to the city, not every day bicycles of this style are seen in the city. It has become tradition by now. We are some friends that meet at a local bakery at nine a clock in the morning for a small breakfast before we all take a ride in to central Stockholm and the start for the tweed event. This year the start was held at Evert Taubes terrace that is located on Riddarholmen right beside the old town. It has a wonderful view of one of Stockholm’s most famous silhouettes, the town hall. When we arrived at the start it was already busy with people. Everyone with old bicycles and dressed up. Ladies in lovely 1940’s dresses, gentlemen in dashing suits and hats. There were lots of familiar faces, we greeted and signed in at the register’s to recive your personal starting number. Then it was time for the photo shoot. Every one that was in this event had their photo taken along with their bicycles. It is a great memory to have later on, many of the participants use Facebook so the photos makes great profile pictures. After all we are aware that people will take photos of us all the time anyway. Almost everyone cheers and applauds and takes photos when we rides along. It is a fun event! An participant of Enskede Tweed drank Enskede brewery porter. Lovely shoes that matches the colours of the leaves. After the officials had some words of wisdom for us, it was time for the start. All 170 of us lined up and left Riddarholmen for a ride around central Stockholm. The officials had made a route this time that was 26 kilometres long. There were some pauses here and there and the traditional picnic at Rålambshov with the traditional group photo. Rålambshovs outdoor theatre where the traditional picnic with lemonade and sandwiches are served. After the picnic, it was an matter of more steep hills and narrow passages for us to conquer. But we managed it with laughs and a good portion of good spirit there are no problems. While we were riding we talked to other riders and people standing on the pavements asking what we were doing. Me and my friends tried to ride along each other. But some times we drifted apart from each others, after a while we drifted back together. There was no contest to win anything. Just a Saturday bicycle ride around the city. 170 of us tweed dressed and riding vintage bicycles among cars, buses, lorries, joggers, baby strollers and curious people. Valhallavaägen in autumn colours. 170 riders enjoying the lovely weather. The finish line was located at restaurant Hasselbacken at Djurgården. We arrived and parked our bicycles and joined up for the events that was ahead of us. When entering the garden of the restaurant here was a jazz orchestra playing old songs, both international and Swedish jazz songs from the 1930’s and 40’s. We all got gin and tonic from Hendricks Gin to cool ourself. 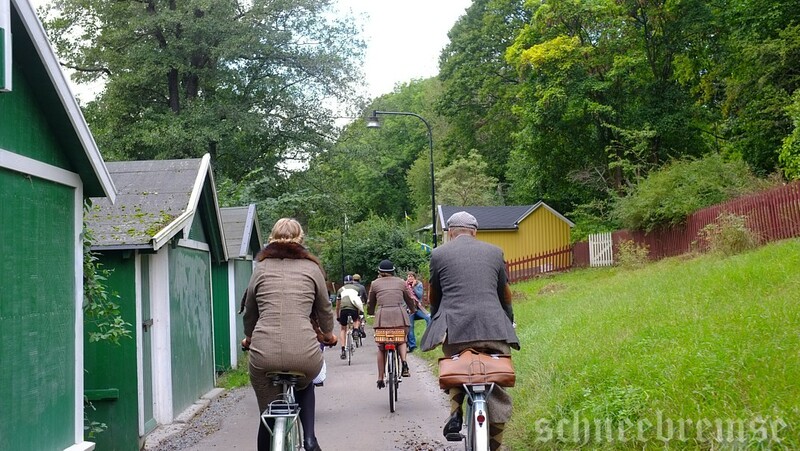 After all, tweed is a warm cloth especially after riding 26 kilometres on an bicycle from 1930´s without any gears among the hilly terrain that Stockholm offers. I understand they who uses gears. Understand, not accepting. Using gears are cheating, or is it? Down hill. A Pelago rider are having fun and resting the legs a bit. When we all was gathered there was a price ceremony. There was prices for best dressed gentleman and lady and their bicycles. Best dressed gentleman, best dressed lady and best dressed youngster. Not to forget the most unusual award by Hendricks Gin. They all deserved the prices! Applauds and cheers! After the price ceremony it was time for the dinner. What a lovely and fun evening. We had a great time, lots of laughs and promises to meet again next year. Later in the evening all the top people within Bike in Tweed sat down at our table and we all chatted, tweed, bicycles all the night. But sadly, everything comes to an end. So did this evening to. We took our bicycles from the parking and headed down to the ferry to get across Stockholm inlet or the Salt sea as it also is called. It is the gateway to Stockholm by sea. The ferry departs from Djurgården and arrives at the old town. Heading home on the ferry. After the ferry landed we said good night to other tweed riders and got up on our bicycles for the long ride home in the middle of the night. Until next time. February 19th was the date set for 2017 version of Winter Tweed Run Helsinki that is held in Finland’s capitol. The meet up for the event was at Senaatintori (the senate square) in central Helsinki, an perfect place to meet. We all had hoped for a sunny day with lots of snow and a at least -20 degrees Celsius bone chilling Nordic winter. But sadly it was +3 degrees and light rain with an heavy overcast instead. This year the weather was more of an dull October day rather than a day in February. When I arrived at the square round about noon, I noticed a group of bicyclists standing in front of the stairs leading up to Helsingin tuomiokirkko (Helsinki cathedral). I joined them, after all, they were standing there with vintage bicycles and dressed in tweed. I guessed they were participants of the tweed run. Right away we started to have a chat and I noticed the kindness and friendliness of the riders. Even if we all was trying to make conversations mixed in Swedish, English, Finish all added with home made sign language. More and more riders with their great looking clothes and nice bicycles arrived and joined us. Both modern and vintage bicycles of all styles and models, Swedish, Finish, Indian(?). It was a great mix of everything. Lots and lots of photos were taken, by ourselves and others. Even tourists came up to us and wanted to know more what we were up to looking as we did. It was an relaxed and happy feeling in the light rain on the square. Soon the organizers joined us. Sadly I never got their names, but they were very kind and helpful in every way. They welcomed us all individually, shook our hands and gave us stickers as an gift with the events logo for this year. We also got information about an race that is held in the summer of 2017 that looked very tempting to join. After a short while one of the organizers stood up on his bicycle and with a old megaphone and announced to us that we was welcome to the seventh annual Winter Tweed Run Helsinki! He explained that we would take the coastal route around the central part of Helsinki. But first of all we all should get up on the stairs to the cathedral and take a group photography. We took our bicycles and climbed the stairs trying to group ourself for a good and fun photo! One of the organizers used the megaphone and directed us, telling us to cheer seven times to celebrate the event. Sadly I do not have any group photo, but I am sure that it will be available on-line. Somewhere. The style is a winner! I placed the sticker on the frame of my bicycle. After the photo we all made us ready for the start. The direction was given and off we went. It is a fun thing when an race like this starts. Tourists stands still and looks amazed on this large group of bicyclists that are dressed in odd cloths. Not to mention the car drivers surprised looks when they sees about 30 riders in a group riding on the streets. Here we are just coming down the stares to for the start of the race. The goal of the route was an café located on the shore on the other side of Helsinki. It is an regular route that they usually use for this event. It consists of bicycle lanes most of the time, the few times we crossed streets with traffic one of the organizers stopped the cars. Because we were riding in a relative tight formation the car drivers showed an great deal of understanding. After all, it is February and some strange people are riding bicycles, “better to let the bicycles pass…”. The bicycle lane along the sea shore had lovely scenery of the sea and buildings on the other side. For me it was special, as one of my favourite films from Finland is Calamari Union made by Aki Kaurismäki. Along the ride we went by the area called Eira that is a famous place in that film. It was really great to be there and see it. We took the bicycle lanes further along the way to reach our destination, Café Regatta. There was a strong head wind sometimes, but for us that was no problem. More wonderful scenery and surprised bystanders. Now we could sit by an open fire or enter the café for a semla pastry and a hot coco, of course with whipped cream on top! Excellent service and really tasty! On the outside we all could talk and admire the bicycles, special made ones, really vintage Crescents, old Hermes and different Finish brands. All sorts of modifications as wine bottle holders and cup holders for coffee that was isolated to keep the heat. The organizers had transport bicycles. One “long John” model that is build as an regular bicycle but has an large luggage rack between the handlebars and the front wheel. The other one was the more common three wheeled version with a large storage box in front. But the most impressive was the fellow dressed in tweed with a cap and an umbrella under his arm while riding all the way on a unicycle! That was truly an amazing sight to see. An 1920’s Crescent, all original. The details on the bell and worn wooden grips are amazing. Hot coco and a semla filled with whipped cream and strawberry jam, it was a real treat. Tasty and delicious. At the café about half of the riders that started said good bye and left. For example the riders from Sweden needed to go back and catch the boat. After the break we all started again and left for the after party that was held in the northern parts of Helsinki. The road there was sometimes really steep but it was really a nice ride, forest roads and great nature. Suddenly one of the riders bicycle broke down. Everyone was trying to help out, but almost all of us only had tools for vintage bicycles, this was an modern bicycle. But they found a tool that did the job so we went on. “Get ready to start”. The megaphone has “speed race” written on it. An forest route was planned. After a while riding of small paths, larger roads, bicycle paths that was covered with ice we arrived at our final destination. It was a club house, where a band should play later on that evening. But up to that point we were welcome to buy some pea and carrot soup, beer and also have a sauna. The kindness among the organizers (I really can not remember their names) was heart warming. After eating some hot and freshly made pea and carrot soup served out of a huge pot, served with mustard. We were few riders that decided to leave this lovely event. I talked to the organizer and thanked him for a lovely day and lovely hospitality. I was so overwhelmed by all expressions, when saying good buy I mistook an honest hug for a odd handshake. I am still ashamed for my awkwardness. The smile says it all, it was a good day. Finally, my personal thoughts on Winter tweed run Helsinki 2017 are simple and straight forward. It was a great event with no rules more than just to have fun and having a great time. But if there will be an Helsinki tweed run 2018, I will plan it way better. Sauna, beer, bicycles and music, count me in. The day we had waited for had come, it was time for Bike in Tweed 2016. We were three fellows in tweed that had decided to meet at 9’a clock in the morning outside an local bakery shop for our traditional breakfast before the start of the event. The staff at the bakery must have been surprised when three gentlemen in tweed suits looking as they came from the 1940’s was entering the their shop and starts to order sandwiches and drinks. Fashionable as can be! But we got many possitive comments on how great we looked. We had a quiet talk about the events during the day while eating an fresh breakfast sandwich. We talked about meeting familiar faces once again and all the happy smiles from the bystanders that will stop and look along the way. The spirit of the event, with music and lots of great bicycles and well dressed people, it was going to be a great day! After the breakfast we all mounted our bicycles and started the ride into the central parts of Stockholm, the old town and Stortorget to be precise. The sun greeted us welcome to the city when we were riding over the bridges and enjoying the view. There we were, three gentlemen in tweed on vintage bicycles along new bicycles and everyday commuters, we got lots of curious looks and smiles. When we got closer to the old town, more and more vintage bicycles with riders also dressed in tweed were visible, we were on the right way to the meeting. When we all were walking the narrow alleys pushing our bicycles, many tourists looked puzzled and took photos of us. It must have been a strange sight for them. The registration for the participants opened at 10 a clock, we were there on time and recived our starting numbers and a bag of things, that included a package of biscuits and an map of the route around Stockholm that we were going to ride. After some talking with the other riders it was time for the traditional photography. Every rider had their photo taken for the start gallery and to document the clothes and the bicycle. There was 166 riders so it took a while to take all photos and register all of us. Then there was the adventure of trying to make room for all vintage bicycles, curious tourists and ourselves on the old square. It was a challenge, but it was fun! Many curious people came forward to take photos and ask what we were doing while we were having a cup of tea and a biscuit. Between all photos, the tea and biscuits we were having in the sun, we talked with other tweed riders and had a really great time. Suddenly the church bells announced that the clock was 12’a clock and it was time for start. Bike in Tweed 2016 was on its way! Laughs, cheers and good luck wishes from tourists and bystanders followed us all along the way to the starting point next to the royal castle where we formed a slightly chaotic starting grid. Then the signal came from the leader, we were off for a 20 kilometres ride around the city of Stockholm. Along the way, the group with all 166 riders was very scattered and formed many small groups. Due to the sheer amount of riders it was impossible to keep a tight formation during the ride. Red lights on the streets, cars and buses scattered us all, so we were in groups of 10-20 riders instead of an united group. Fortunate there were some planned round up places for us to all get back together as a unit during the course, that was necessary and was a good move by the designer of the route. After rounding all up, we continued our ride and headed to the open air theatre at the “Rålambshovs” park and the picnic we always have there. The break was really needed, after all. It is very hot to ride up and down the hills and bridges of Stockholm with a heavy three piece tweed suit from Harris Tweed. While wearing a hat. The cucumber sandwiches and lemonade that the events sponsor Hendricks Gin offered tasted really great, it was just the bees knees for us tweed riders. Many riders had also their own food and drinks in typical baskets, some had wine and real china with them to eat on. Others, like me had some sandwiches wrapped in paper. Just as they use to do it in the olden days when having a picnic. My sandwiches were made by slices of Skogaholms loaf, that is an classic. Of course topped with the equally classic “cognacsmedwurst” sausage. Every child have had those sandwiches on field days since 1945. Instead of the bottle of milk we has as kids, I brought along a bottle of beer. It was just perfect for the Bike in Tweed picnic. At that time we also were having our group photography taken. Every rider was standing by their bicycle and an photo was taken of us all as an memory. We were also taking photos on each other, our clothes and bicycles, all the lovely hair creations and all great tweed suits. So many photos! Then we were off again! Out and around the streets, out into the traffic, up steep hills, trying not to crash into each others when taking narrow corners in construction zones. All 166 of us together on bicycles had to get along with with cars, pedestrians and everyday cyclists. There was some talk about the unfortunate choice of route for the event. Many walkways we took was very narrow and steep. This year I was riding a single bicycle, not a tandem. For me it was very easy to get around the course. But I felt sorry for those brave tandem captains and stokers. The captains trying to manoeuvre those heavy battle cruisers true the narrow nooks and crannies of walkways between roadworks and hedges. It puts the captain to test with navigate and planning the ride. Then we all arrived at the end destination, the goal of Bike in Tweed 2016 event. The finish line was located this year at Armémuseet (Military museum). They let us use their courtyard as a collection point, but also so we could have a price ceremony. There were speeches about the day and prices were given to best dressed gentleman and lady, the best looking bicycle. A special price went to the gentleman who joined the race in a bicycle car that was built after drawings from the -40´s. Hendricks Gin, the sponsor, treated us with Gin and tonic after we all had made it to the finish line. Later on during the price ceremony Hendricks Gin had an special award for the most unusual rider. Just before the price ceremony there was live music, we all sang along and had fun. After mingle and talking with everyone many of us had signed up to join the after party with dinner at Hasselbacken restaurant out on the island of Djurgården. It is a famous old restaurant where we had a stop last year. We arrived there 30 minutes later on our bicycles and parked them on the grass and sat down at our tables, looking at all vintage bicycles standing under the trees. The evening followed with drinks, food and laughs. Later that evening we had to ride our bicycles home. 14 hours after I mounted my bicycle and left for the breakfast, I was back home again and parked the bicycle in the storage. Welcome back dear reader! How has your summer been? Way to hot when using tweed I guess. Perhaps even to hot for riding an old bicycle with no gears and wobbly wheels? But now when the weather are cooler and the autumn is around the corner it is time to take the old tweed suit out in the fresh air. Different unplanned things happened this summer, but other things did not happen as planned. For example my bicycle projects I mentioned earlier did not happen. The Monark racer is still standing in a corner collection dust, the black Hermes frame and all the belonging parts is still in parts. The Pelago Path racer I built a few years back are about to be sold. The reasons for all those things are equally simple and silly. First is the reason that I feel stressed out due to the lack of space for building and renovating old bicycles. Then there is that racer style bicycles is killing my back when riding them. I can simply not sit leaned forward on a bicycle for a long time. So why have bicycles around that I do not use? Better to sell them and save money to a bicycle that I can use without problem. But to one thing that happened that was a fun event! Saturday the 3rd of September 2016 the 4th annual “Malmö Tweed Ride” was held. 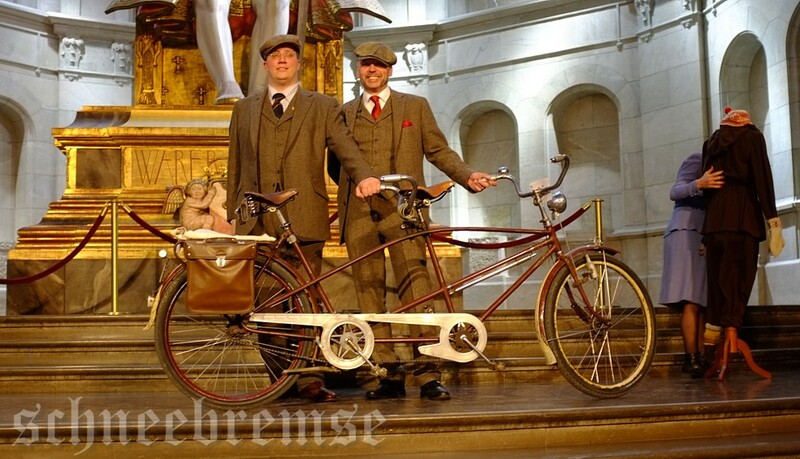 It is like the “Bike in Tweed” event in Stockholm, or like the “Tweed Run” in London. 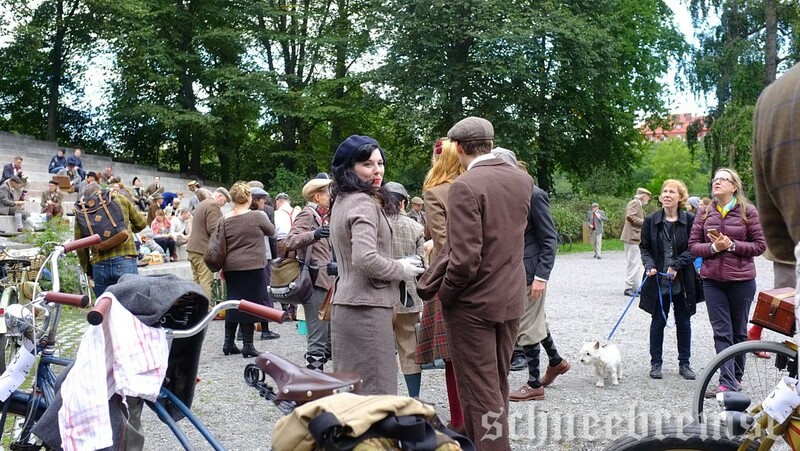 It is a gathering of people that loves old bicycles, tweed clothes and likes to dress up. I was there with my old Hermes from 1956. We all gathered at Gustav Adolfs torg (square) in central parts of Malmö around noon. I was there and noticed many tweed riders joined from all streets leading up to the square. The weather was perfect for us, cloudy with a bit of sun from time to time. When the time was 13:00 the announcer greeted us welcome, it was time to register and each rider would receive a pin. It was a pin that shows that you were a participant of the race this year. Well, race is perhaps the wrong word, a run or parade, perhaps even an show and gathering while riding mostly vintage bicycles in a calm speed across the town is more accurate. So we all could enjoy the surroundings and all the lovely bicycles in the parade. After receiving our pins, we all formed a starting line and we left Gustav Adolfs torg for a ride along the old city of Malmö. People cheered and waved to us along the streets. Many was happy and asked us what it was all about, old persons talked about how they used to have an bicycle, just like the ones we were riding, when they where young. With a smile and a nostalgic look on their faces they watched us making noises with our bells and horns along the way. The ride went around Malmö for a while before we had a stop at Västra hamnen (West harbour) where the old mechanical warehouses was located and was nod demolished for new buildings and developments. It was a large place at the water front where the sponsor Hendricks gin served us lemonade and cucumber sandwiches. Tasteful and refreshing in the last of the summer sun rays! There was music during the rest, an gentleman played jazz records on a old gramophone, complete with funnel and crank. It was really nice to sit and listen to old crackling 75 rpm records and drinking lemonade. After the break there was time for the group photo, we all were directed to sit in a group on the board walk. After the photographers was happy we all went for our bicycles again and started the final leg of the run. The path we tool led us down to the sea side and the new land mark in Malmö, the “turning torso” tower, it is an apartment house with 54 floors. Impressive and we where riding just at its base and entrance. Then we took the roads back to the central parts of Malmö where we all ended up in Folkets park “the peoples park”, it is the oldest peoples park in Sweden. It was founded over 120 years ago. When arriving there we all received a drink ticket from Hendricks gin, non-alcoholic alternative were available to! Then it was mingle and chatting with all the participants. We all sat on the dance floor in old furnitures and listened to Svempas Swinging Trio, an jazz trio that played old standards in a really refreshing way. Lots of energy and joy! There was a small vegetarian buffet that was really nice after the long ride we just finished. After the food and mingle it was time for the prize ceremony. Best dressed lady, best dressed gentleman and the best looking bicycle. Hendricks gin had also the special prize “the most unusual award”. It was a great evening and an perfect ending to a fun and nice day in Malmö. Friendly people and an great atmosphere an flawless organisation and arrangement! Good briefing of the guidelines and that there was an bicycle repairman in the parade, but most important an medic that was scanning the parade all the time. In short it was a great event! I lift my cap for you and we will see you all next year! Then the day came, it was time for the bicycle event again. Bike in Tweed in Stockholm 2015. To get a good foundation and build up some energy for the long bicycle ride that was before us. We started with breakfast at an bakery in a sleepy suburb. There we meet up with our friends that also was entering the Bike in Tweed event with an old Rex tandem, just like the one we have. But in a blue color and some other minor diffenreces. At the bakery we parked our bicycle outside went inside for some lovely and fresh bread. While we were sitting there we noticed that the people walking by on the outside, watched, looked and smiled att our bicycles outside. It seems that old vintage bicycles makes people happy. After the breakfast we started our journey toward the centre of the city with the royal castle as goal. It must have been a strange sight, two old tandems after each other, with the riders dressed in tweed clothes just crousing down the streets. In fact there was at some point people even smiling and cheering at us when we passed them on your journey in to the start of the tweed parade. At the starting point at Nytorget, we were among the first to arrive. We parked out tandems beside each other and went to the register office and got our numberplate’s for identification. We got two one for each rider on the bicycle, but we were riding on only one bicycle. That usually makes the officials rather confused. Is it two riders or one bicycle? Is it the bicycle that should have the number, or is it the riders? But we put our both numbers in a rather fun way on our tandem. One number at the front of the bicycle and other at the rear, someone would be confused. But it worked out like a charm, no one did notice that, at least as we knew! At the start when we all that registered us, we also received an bag with a map of the route, some commercials and a package of Scottish shortbread cookies from the sponsors. Inside there was also an voucher for an beer at the Nordic Museum at Djurgården at the finish. Another of the sponsors, Hendrick’s, said that they would treat us with a gin and tonic just before the finish. As the time went by, different riders started to join the event. There were old vintage bicycles, new modern ones to. Many of the riders was dressed in fancy vintage dresses, old puffy plus 4 trousers, retro sharp suits, nice flamboyant hats and great really lovely shoes. One of the riders actually said, “we do not dress for fun, we dress in a nice way”. After all, this is not an event to act like a clown (as many bystanders might think). Many of the riders dress like this because they want to, we like the look of tweed and the old style of clothes. But sadly many of us never got a suitable moment to dress up in tweed suits and vintage clothes. Bike in Tweed are an perfect opportunely to embrace the well dressed and use good looking clothes and to use our old bicycles. We all started to cue to have the official individual start photos taken, the start was getting closer by the minute. Then the word was out, it was time to start the parade (more a parade than a race). Then we all were off, all 160 of us! 160 bicycle bells where ringing in the morning. Tourists were confused by the noise, bystanders cheered. There were children on small bicycles, race riders with vintage road racers, really heavy tandems bicycles (I used to call my tandem “the Dreadnought” because it is so big and heavy). All generations of both bicycles and their riders was represented in the parade. A young girls skirt needed some attention at the start, the advantage with an event like this, is that there always are people available with the know how to mend and fix vintage items. The girl had the skirt mended on location. In every way. As we ride along the route, there was some stops along the way, just to let everyone to catch up so we all could ride in a tight formation along the streets. The ride along the waterfront was nice, the bicycle tires silently floating over the walkways. There was old boats at the docks, small cabins along the way and the trees were starting to get yellow leaves on their branches. It was a great autumn day for a tweed parade. No sun and no rain. A perfect bicycle and tweed day. In the middle of the race there was a stop at the park theatre at the Rålambshov park just outside the city. It was time for picnic and the official group photo of all riders and their bicycles. It was nice to sit down and have a cup of tea and a sandwich. 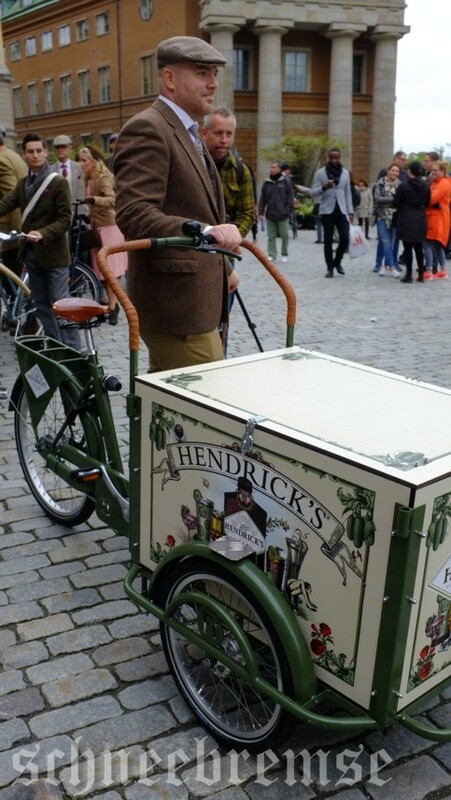 One of the sponsors of the parade I mentioned earlier, Hendrick´s Gin, were there and offered lemonade and cucumber sandwiches to the riders. We all got time for admiration of the other bicycles, discussions with people with the same interests, laughs and music. It was really nice to have a break at the park theatre. Then after a while we were off again, towards the next stop on the route at Hasselbacken restaurant where a cold gin and tonic was awaiting our arrival. It was a long way there, lots of hills and traffic. We were going straight in the middle of the city. But it was said that just this day all car traffic in the city was not permitted in order to make it easy for bicyclists, that was just perfect for our parade. I guess there is no need to say anything about the roads that was chosen for us. But I feel that I must say that this year to use the central parts of Stockholm as an route was a bad decision. Roadworks, closed off lines, 160 bicycle riders together with buses and taxis in the same lane. As mentioned, it would be a “car free day” in the city. It was, but sadly not where our route was planed. For me as an bicycle rider on a big, heavy tandem bicycle, keeping the balance in very low speed and at the same time keep my eyes open for buses, taxies and other riders was challenging. It was a fight, as commander of the “dreadnought” I worked all my skills in navigating between people, taxis, buses and other tweed riders. But it all worked out fine in the end. At Hasselbacken, again the nice sponsor Hendrick´s Gin gave every rider an voucher for a gin and tonic (non alcoholic alternative was available of course) in the restaurants outside garden. We salute the nice gesture with a bow and keeping Hendrick´s in mind for the next gin purchase. After riding for a few hours the ice cold GT was very, very tasty and made the riders temperature go back to normal. Especially after the hills and the traffic in the city. Again we talked a lot and laughed, the spirit was high and we all looked forward to the finish and the events at the Nordic Museum. So after some time we all started again, down the road a few hundred meters to the Nordic Museum where we all was shown to the side entry of the museum to bring in all bicycles up to the main hall where they should make a display. At the museum they had an all day long event in the theme of the 1940’s for the public to visit. Cloths, fashion show, dance shows and the restaurant served 1940s themed food. The peak of the day was when we all came and put all or bicycles on display in the main hall. It was a pity that the bicycles was standing there only for a short while. It would have been a great display to watch all bicycles, having all the owners write a small note with information and history of the bicycle. I had my trusty camera with me, the Fujifilm x100. But I must confess. I did not take as many photos as I wanted, there was so many other things to do and see. But I got a few photos, among the ones in this post. Considering the amount of lenses and smart phones that was aimed at us during the parade. I guess that there will be many more photos around the inter-web soon, featuring Tweed and old bicycles. 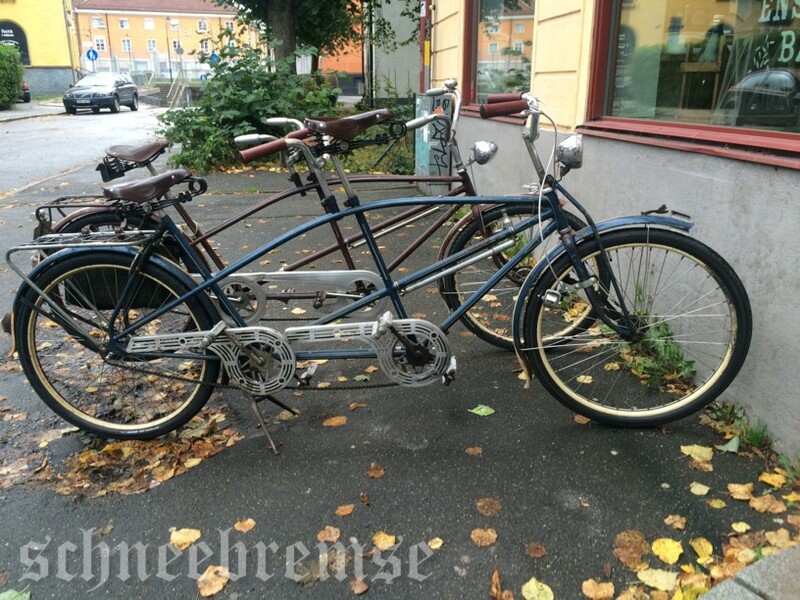 Perhaps one and another “Dreadnought” tandem bicycle. There we were standing, having a beer and waiting for the price ceremony. There had been a jury judging the riders and bicycles right from the start and now it was time to learn what the jury had decided. There was a price for best dressed lady, that was a lovely girl with a fantastic hairdo, all in a typical 1940’s sporty look (she is the girl mending the young girls skirt above). Then we had best technical bicycle, that was a Norwegian chap that came to Stockholm with his Norwegian bicycle. It was really nice! The there was a price for the best dressed youth. It was a girl which dress had broken at the start (also seen on the photo above). Then there was a gentleman from the northern parts of Sweden. He got a price for his appearance, all dressed in a 1890’s bicycle uniform, riding an high wheeler from Holland. Then they announced that there were a price for the best looking carriage. It was awarded… us?! We got an price for looking great on our 1940’s Rex Duplex tandem bicycle. So we had to enter the stage and receive the cheers from the other riders. Now that was a real surprise! Bike in tweed 2016? Of course. See you there.